2 Share any flower you like or unique referral link with your friends. 3 Get 50% of cryptoflowers earnings when your friend buys a new G0 flower, or breeds two flowers, or completes a selling or breeding auction. 4 Earn more! Build your own cryptoflowers referral network! Up to 30% of players income invited by your friends (up to 10 levels)! What is CryptoFlowers Invite a Friend program? CryptoFlower Invite a Friend program is a special offer for active players that allows you to earn money with CryptoFlowers. When a player registers an account using your personal link, he or she becomes your invitee. From that moment you will receive 50% of our earnings from that player’s transactions in the Game. How do CryptoFlowers earn money? We collect 1% commission of all trading operations (buying and selling), fixed Growing Fee, which is currently 0,002 ETH and the price of new G0 flowers sold from our Breeding Lab. Which activities of referrals are rewarded? 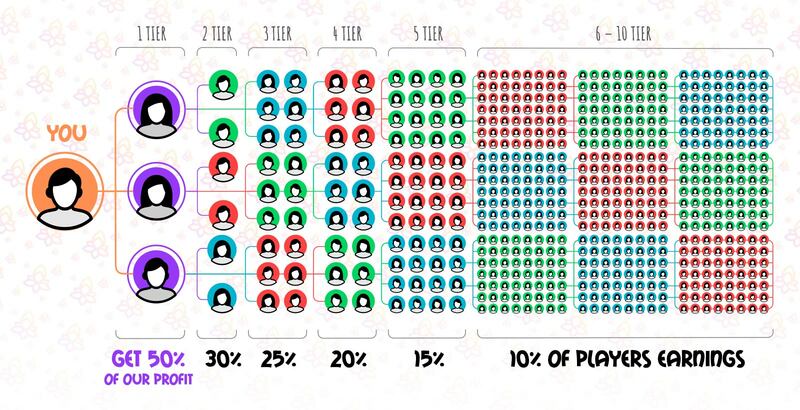 You will receive 50% of our earnings when your friend buys a new G0 flower, or breeds two owned flowers together, and up to 50% of our earning when your friend completes a selling or breeding auction. Where can I see how my referrals are doing?